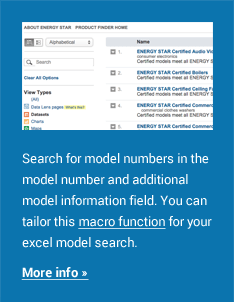 In addition to the consumer product finders for ENERGY STAR certified models, EPA maintains 50+ related product data sets at data.energystar.gov that are updated daily. The interface for these data sets allow users to generate a variety of reports, to create accounts for saving and sharing their work and to export data in a variety of different formats. EPA offers a guide on how to analyze these data sets and create data visualizations. Developers can access the information in these data sets via API at data.energystar.gov/developers and link to other databases, build apps, and more. More information about updates to data sets and EPA’s approach to API versioning is available here. Want to know about changes to the ENERGY STAR data sets and API? Want to connect with other developers who are using the API? Sign up for the, ENERGY STAR Products API Google Group.